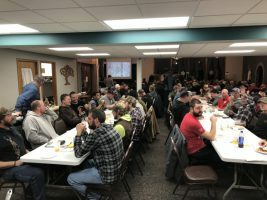 The annual Arrows & Antlers banquet was another great success. This was our fifth year at Savanna Oaks in Fall River, WI. After a week of record-setting cold from a polar vortex, we were blessed with a weekend warm-up in time to enjoy our gathering! Once again, the spread of wild game was absolutely outstanding, thanks to Gary Merkes and chef Steve Johnson. 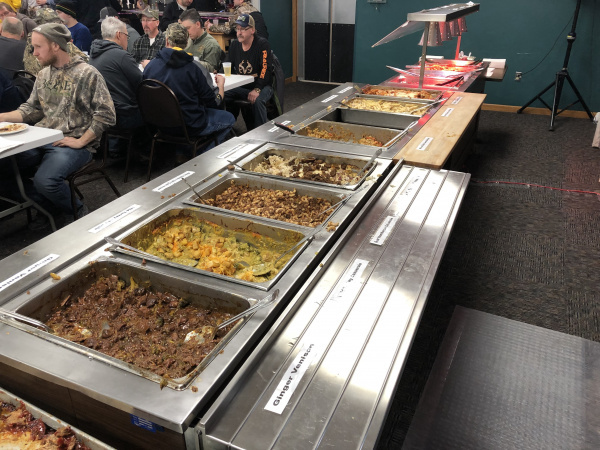 This year’s menu featured a variety of venison, elk, bear, turkey, pheasant, and bluegill – and we washed it all down with 5 – ½ barrels of beer. Also, a special “Thank You” is in order for Dennis McDonald and Soybean for all of their assistance in making the event a success! We had another great year of generous sponsor donations and door prizes, along with our specialty raffles. 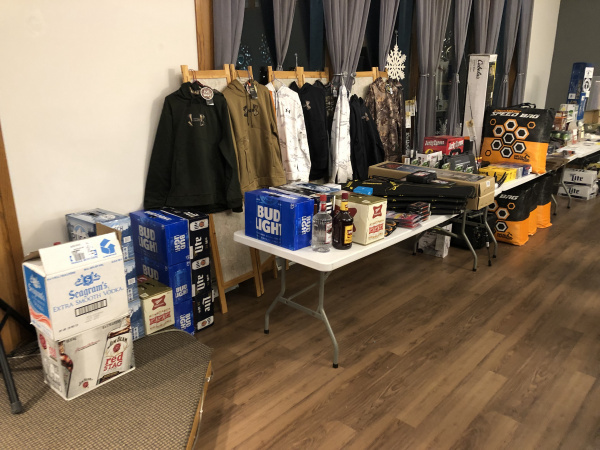 The Mission Crossbow set was won by Terry Gomez, The Mathews Heli M bow was won by Chase Peterson, and our annual beer/booze/cooler raffle was won by Joey Schweppe. 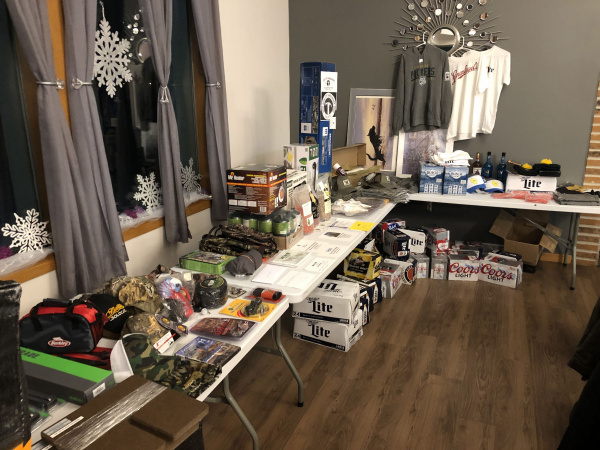 We also raffled off $5,500 in cash prizes, given away as 11-$500 prizes – those winners were: Randy Holguin, Brayden Hemenway, Jerry Crook, Colin Brumm, Ken Patterson, Jimmy Zbigniewicz, Joe Steinhofer, Brian Safford, Travis Weissenfluh, Kris Hellenbrand, and Joey Schweppe. 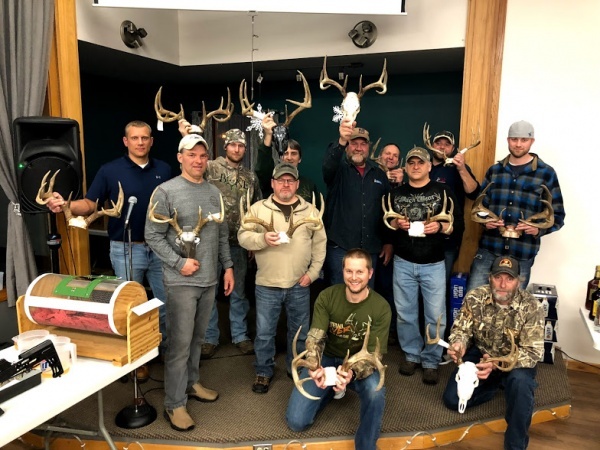 We had a record year of buck entries, with 20 (yes, 20!) 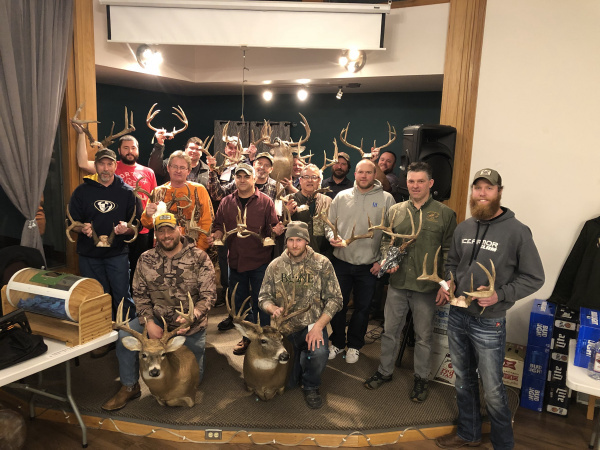 entered into the contest – and the results were: 1st place – Mark Wolfgram (155 5/8), 2nd place – Jerry Crook (154), 3rd place – Randy Vant Hoff (145 5/8), 4th place – David Benrud (141 3/8), 5th place – Todd Brumm (134 2/8), 6th place – Joey Schweppe (131 7/8), 7th place – Lenny Hein (125 6/8), 8th place – Steve Patterson (124 4/8), 9th place – Kevin Moreland (123 6/8), 10th place – Jeff Olson (119 6/8), 11th place – Scott Johnson (118 3/8), 12th place – Nick Schroedl (117 4/8), 13th place – Scot Junge (117 3/8), 14th place – Randy Holguin (117), 15th place – Adam Gross (112), 16th place – Jmmy Zbigniewicz (110 2/8), 17th place – Gary Merkes (108), 18th place – Raul Gomez (107 6/8), 19th place – Tim Larson (unknown score – disqualified for absence), and 20th place – Chad Killerlain (unknown score – disqualified for absence). The membership fee for the upcoming season remained at $35, and the majority of our members paid their dues for the 2019 season – for those who didn’t, your $35 is due by August 1st, otherwise your membership is forfeited to a new member. The waiting list is ever-growing, so please get your dues paid as soon as possible. Thank you to all of those members that paid for next year at the banquet. Also remember that guest spots for the 2020 banquet are reserved on a first-come, first-serve basis, for $25 each, paid at the door. If you are interested in reserving a guest spot, please send an email to contactus@arrowsandantlers.com. Thank you very much to all the members and sponsors who help make our annual banquet as anticipated and exciting as it is each year. We look forward to another great year of hunting and fellowship! From left to right: Front Row – Randy Vant Hoff (3rd), Mark Wolfgram (1st, Joey Schweppe (6th). Second Row – Lenny Hein (7th), Jimmy Zbigniewicz (16th), Randy Holguin (14th), Jeff Olson (held by Randy Holguin) (10th), Raul Gomez (18th), Nick Schroedl (12th), and Scot Junge (13th). Back Row – David Benrud (4th), Steve Patterson (8th), Todd Brumm (5th), Gary Merkes (17th), Jerry Crook, (2nd), Kevin Moreland (9th), and Adam Gross (15th). Not pictured — Tim Larson and Chad Killerlain.